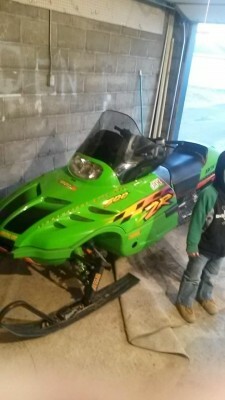 I have a 98 Arctic Cat zr 500. Oil injected, liquid cooled. 7/10 overall condition due to the usual tear towards the back of the seat, and a few minor blemishes. Still a very clean sled! Runs mint, usually starts 1st or 2nd pull. Has new chain case bearings (drive line) also on the clutch side I did a new bearing along with a Speedo key. Hand and thumb warmers work also. 98 is a great year for the zr. Power to weight ratio is fantastic, it will hang with newer 6&700 sleds. An all around fun dependable machine.